While Harry napped today, Emme and I received a special Easter delivery! And even if you don't have these adorable little bunnies to bring you a treat, you and your child can easily make them up in less than an hour. The super simple recipe can be found here, on the Rice Krispies' page. The only minor differences with our recipe was that we used an orange and lemon flavoured marshmallow (to my friends in the States- don't even ask about them!) so the color was a slight orange hue, and we rolled ours in some sprinkles instead of decorating with frosting. The possibilities with Rice Krispies really are endless! Have you checked out their webpage for ideas? The company offers hundreds of ideas and all recipes are sorted by category (Top Treats, Breakfast), ingredients (ice cream, fruit) or kids' skill level. While the original Rice Krispie treat will always be my favorite, I definitely want to try this recipe for bars that include peanut butter, chocolate and butterscotch. YUM! 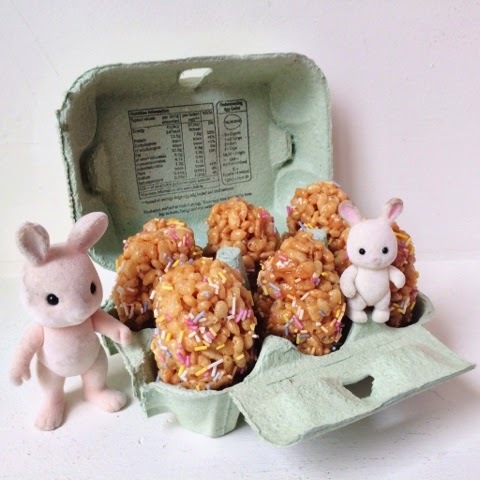 These Rice Krispies Easter eggs were fun to make with my daughter. Emme enjoyed stirring the ingredients in the bowl, molding the ingredients into their egg shapes and rolling the eggs in the sprinkles. 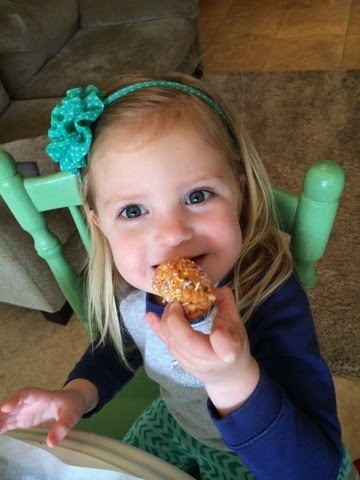 And of course, her favorite part was EATING the sweet treats! What are you making for Easter dessert this year? Comment in the section below and let me know! Yummy they look good. Enjoy and have a great Easter. They were delicious! And happy Easter to you!